Winged viviparae of Tuberculatus borealis are pale blue-green, yellow mottled with green, or yellow, with blackish-banded antennae. The terminal process of the sixth segment of the antennae is 0.9-1.3 times the length of the base of that antennal segment. Abdominal tergites I- IV each have a pair of spinal processes, but those on tergite IV are sometimes very small (cf. Tuberculatus annulatus in which only abdominal tergites I-III each have a pair of spinal processes). The siphunculi are only apically dark (rarely over more than the distal half). The body length of Tuberculatus borealis alates is 1.9-2.3 mm. 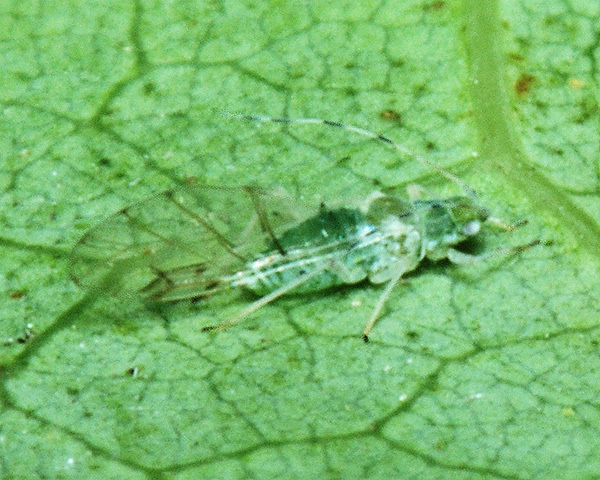 The blue-green oak aphid is found on English oak (Quercus robur), more rarely on other oaks. Tuberculatus borealis is found across northern Europe into western Russia and east to Iran. It has been introduced to North America. Very little work has been done on the ecology of this species. 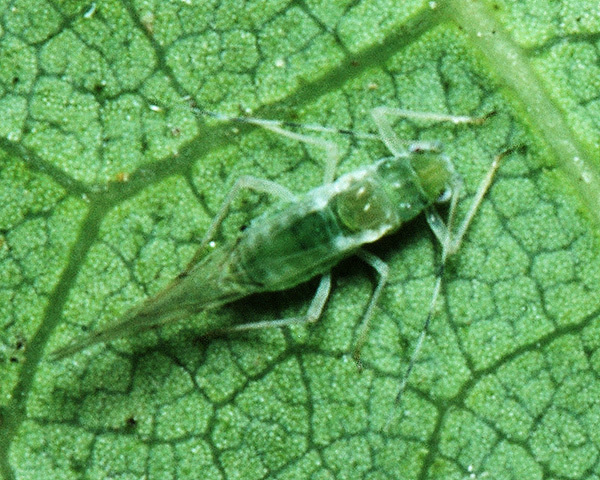 Ratajczak & Wilkaniec (2011) conducted studies on the structure of aphid communities on trees. One such study was done in The Kornik Arboretum in Poland. Sampling was by Moericke water traps for alate aphids and by searching of the plants. The structure of communities was characterized using a number of indices including the number of specimens, the number of species and the dominance index. Tuberculatus borealis comprised 1.02% (= dominance index) of the aphids found, putting it in the 'recedent' (1-5%) category. It was less common than Tuberculatus annulatus which in Britain is usually the commoner species. Senol et al. (2015) reported Tuberculatus borealis as new to the aphidofauna of Turkey, and provided a useful description of the species' distinguishing features. Tuberculatus borealis have been recorded from 5 Quercus species (Quercus cerris, Quercus ×hispanica, Quercus mongolica, Quercus petraea, Quercus robur). Of the 34 species on common or pedunculate oak (Quercus robur) Baker (2015) lists 15 as occurring in Britain: Hoplocallis picta, Lachnus longirostris, Lachnus roboris, Moritziella corticalis, Myzocallis boerneri, Myzocallis castanicola, Phylloxera glabra, Stomaphis quercus, Stomaphis wojciechowskii, Thelaxes dryophila, Thelaxes suberi, Tuberculatus annulatus, Tuberculatus borealis, Tuberculatus neglectus, and Tuberculatus querceus.